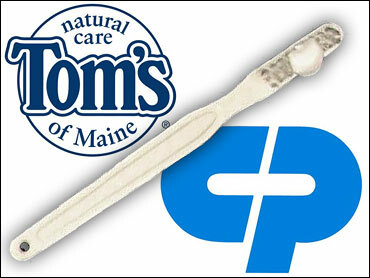 Consumer products maker Colgate-Palmolive Co. said Tuesday it agreed to purchase control of the privately held Tom's of Maine, which makes "natural" toothpaste and other personal care products, for $100 million in cash. The deal reflects Colgate's strategy of focusing on the higher-margin oral and personal care businesses. Colgate said the deal for 84 percent of Tom's is expected to close in the second quarter. The Chappell family that founded Tom's of Maine will keep a 16 percent stake in the company. Colgate will have additional share purchase opportunities over the coming years. The U.S. market for "natural" oral and personal care products is valued at $3 billion and is growing by 15 percent per year, Colgate said. Tom's of Maine, founded in 1970 by Tom and Kate Chappell, pioneered natural toothpaste, mouthwash, and deodorant, and is a leading oral care brand in its category. Reuben Mark, Colgate's chairman and CEO, said Tom Chappell will stay on to lead the company, which will remain based in Kennebunk, Maine. Colgate, which makes Colgate toothpaste, Palmolive dishwashing liquid, Mennen deodorant and Irish Spring soap, expects the acquisition to be neutral to its 2006 profits and increasingly positive each year thereafter.